11 Day Cuba Tour - Holiday Rumba US$2000 / person. 10 nights in privately owned comfort class Bed & Breakfasts (casas particulares), double occupancy. Santa Clara accommodations may be in a 3-star hotel. Included Activities Walking tour of Santa Clara, Che Guevara Mausoleum, 1 night of Parrandas de Remedios festival, Manaca Iznaga Sugar Plantation visit, Trinidad orientation walk, Christmas group dinner in local guesthouse, Walking tour of Trinidad historic center, introductory group Salsa Lesson, Walk to Javira waterfall, Cienfuegos orientation Walk & visit to Castillo del Valle, Playa Giron museum & documentary film, Bay of Pigs snorkelling, half-day Vinales cultural/scenic trek including Tobacco Farm visit, Cooking class & dinner, organic farm visit and tour, Soroa orchid garden tour, Visit to Jaimanitas community art project, New Years Eve Cathedral Plaza dinner and show, Old Havana half-day guided walk, Cuba national day cultural activities. All breakfasts, 5 lunches, 8 dinners. Airport arrival transfer. Private local Cuban guide throughout.
! The tour starting on Dec 22 will have 2 nights in Havana at the start of the tour, and only 1 night in Havana at the end of the tour. Last day / Departure day is Jan 1. Tour requires a minimum of 4 passengers to depart. Please do not book international flights to Cuba until the tour is guaranteed. Spend the holidays with us in Cuba and experience a diverse array of special celebrations to usher in the New Year! This tour includes the unforgettable Parrandas de Remedios celebration, a homemade fireworks spectacular where two neighborhoods battle it out for the best display. The best way to get an authentic Cuban experience is to party the night away with Cuban families in the plazas of the little town of Remedios. We celebrate Christmas in the colonial town of Trinidad, with a special meal prepared for the group. 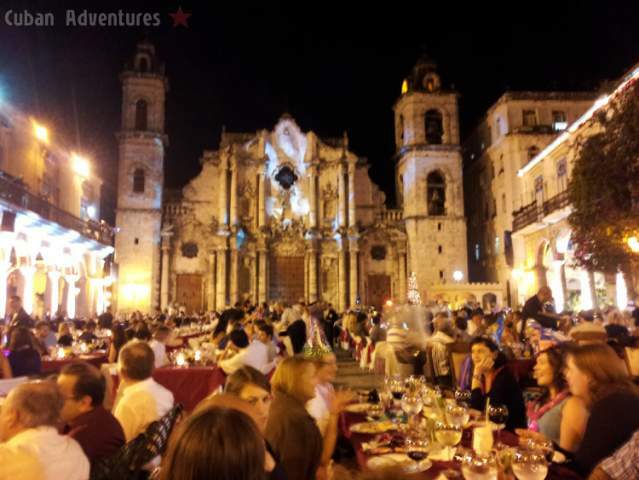 The New Year's Eve celebration in Havana's gorgeous Cathedral Square harks back to the pre-revolutionary glamour days of Cuba, with a multi-course dinner, drinks and Tropicana style variety show all with a beautifully lit cathedral in the background. In addition to the special holiday celebrations, this tour includes the fun and educational people to people activities of our 9 day tour so that you experience all the unique aspects of Cuba. We bet your New Year's resolution will be to one day return to the beautiful and fascinating country! Welcome to Cuba! Arrive in Havana at any time today, our airport greeter will be waiting to take you to your B&B accommodations. We’ll meet the local tour leader and have dinner together at a local paladar (privately owned restaurant). 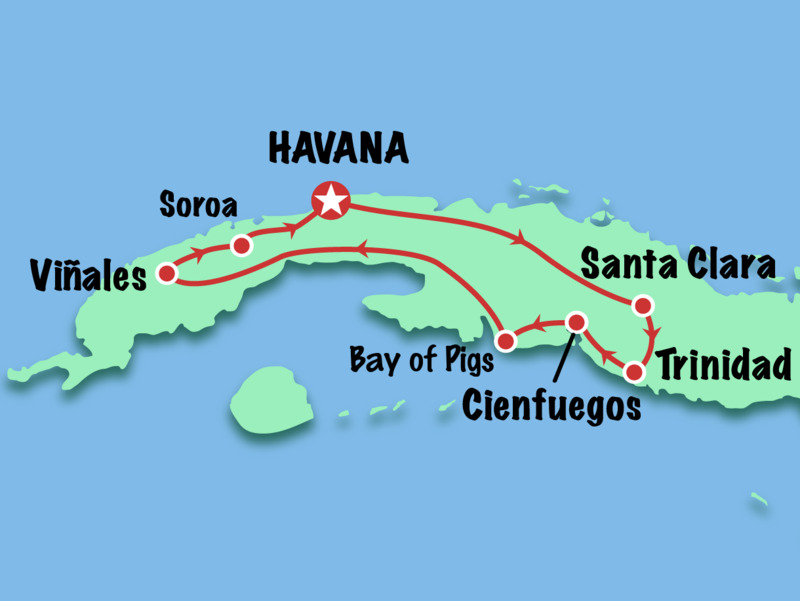 From Havana, it’s about a 4 hour bus ride through the flat central region of Cuba, where there are lots of citrus plantations, to Santa Clara (we will stay the night here in a simple hotel or B&B just outside of the city, and about 40 minutes from Remedios). Before going to the festival, we will take a walking tour of Santa Clara, and visit the museum with the iconic statue of Ernesto Ché Guevara. We’ll have a bit of time to rest up for the party before we head out to Parrandas de Remedios, the highlight of the tour! The Parrandas de Remedios festival is the oldest and one of the liveliest traditional festivals in Cuba. Anyone who has seen it can tell you just how crazy it is! Our arrival coincides with the climax of the celebrations on Christmas Eve. The celebrations include street parades with rumba percussion ensembles, music and verses, a float display and the very dramatic fireworks competition. The festivities can get a bit hectic at street level, so you have the option of watching the action from the roof top of a house that we have pre-arranged. On the way to Trinidad we first pass by Manaca Iznaga 16km East of Trinidad in the Valle de los Ingenios where we will learn about the slave trade in Cuba. Climb the 44m tower that was built to look over the slaves as they worked. It has a sugar cane press that the slaves used to operate, and the village around the mansion is inhabited by direct descendants of the slaves. The beautiful colonial city of Trinidad is home to numerous churches and many beautiful colonial buildings. We’ll have just enough time for an orientation tour of the city and then you’ll have time to freshen up for tonight’s festivities, a special Christmas group dinner lovingly prepared by our homestay hosts. This morning we begin with a cultural tour of Trinidad where we will visit various museums including the Afro Cuban temple to Yemaya for a brief introduction to Santeria. The afternoon will be dedicated to learning about the importance of dance in Cuba. We will meet with members of Baila Conmigo, a dance school and performance troupe. Partner up with members of the troupe for a fun and challenging introductory salsa lesson which will come in handy for a night out on the town. The nightlife in Trinidad is probably the most accessible and intense in all of Cuba, with numerous live music venues and many dance performances every day of the week. One of the best venues is a disco in a cave on a nearby hillside. Today we will learn about the history of the area and the local industry and biodiversity as we take a short hike to a waterfall outside of the city with a local expert guide. On the way we stop in a very simple campesino’s home to learn about life in the rural areas of Cuba. After cooling off in the natural pools, we return to Trinidad where you’ll have the rest of the afternoon to relax, explore, and interact with the locals. Today we depart for Cienfuegos the “Pearl of the South”, a city founded by the French, which lends it a distinctly European flavor, with a wide Parisian-style boulevard and elegant colonnades. Like Havana, Cienfuegos has a beautiful Malecón, where you can pass a peaceful evening watching fisherman cast nets and locals socialize. We’ll take a walking tour of this city on the bay and visit the breathtakingly ornate Palacio del Valle. On the way to Viñales we drive along the picturesque Bay of Pigs past the site where the landing of U.S. sponsored counter-revolutionary exile militia occurred in 1961. Today there is a museum here that recounts the events of this conflict which resulted in the first defeat of a U.S backed take-over in Latin America. There are some beautiful places to stop for a swim along the way including a sink hole which resembles a huge natural tropical fish tank, time permitting we will stop for a swim so make sure to pack your swim wear. We will reach Viñales in the evening and have time for a short orientation tour. If you need to stretch your legs from the long bus ride, the nightlife is very active in this village with the local residents more than willing participants in dancing to the local live music. Today we spend the morning learning the tradition of Cuban cigars from a farmer and expert cigar maker. Get an insight as to how the communist system works, how much tobacco they will keep, how much produce they give back to the government, how they make ends meet! You will learn about the process from tobacco planting to rolling the final cigar. In the afternoon we learn to cook Cuban-style with a cooking lesson from a local chef. Learn how to platos tipicos Cubanos like congri, potaje, garbanzo soup, ajiaco, and flan. In the evening tour an organic farm and learn about sustainable farming in Cuba. Here we meet our local farmer and his family who will show us around the organic farm and explain to us the methods used to cultivate crops without the use of pesticides. With the beautiful sunset as our backdrop, we will enjoy a deliciously fresh and diverse meal prepared by the family, a truly authentic farm-to-fork experience! On our way back to Havana we will stop off at the mountain resort town of Soroa where we will tour the orquid garden with a local botanist, and take in the beautiful views of the surrounding forested area. Just outside of Havana we will visit the fishing village of Jaimanitas and the home of the famous artist Jose Fuster. Fuster has made his entire home, and much of the surrounding neighborhood, into an artwork using tiles in mosaic forms. Now referred to as Fusterlandia, it is a unique work of public art with over 80 houses decorated with ornate murals and domes to suit the personality of each of Fuster's neighbors. You will be able to meet with the family to discuss their art projects and view the cuba-photo-gallery in Jose Fuster’s home. 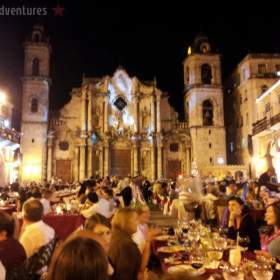 The setting for our New Year's Eve dinner/show is the impressive Cathedral Plaza in Old Havana. The only restaurant in the Square, called El Patio, brings all their tables outdoors and caters for 300 diners. Wine, champagne, beers and all sorts of spirits including the famous Habana Club rum are served plentifully and the food is a compilation of Cuban recipes. A purpose built stage hosts a spectacular Tropicana style outdoor music and dance show. Today is an important day in Cuba, the anniversary of the Triumph of the Revolution! There will be free concerts today to celebrate the success of the ragtag band of guerillas that ousted the Bastista dictatorship. In the morning we take a guided walking tour of Old Havana. In addition to visiting historical sites, we will learn about the impact of the dual-currency economy by visiting commercial centers, where goods are purchased in CUC, and ration or peso stores, where goods are purchased in CUP. The afternoon will be spent learning about the fascinating and unique aspects of Havana outside the city core and taking advantage of the special festivities for this important national holiday. We will have a final dinner together at a local paladar and of course, one final fun-filled night of music and dancing! Say good-bye to your new friends and head home to the US. We hope you enjoyed your Cuban Adventure and will come see us again soon! Prices start at US$2000 per person. We require a US$400 per person non-refundable deposit to reserve your place on the tour. The remaining balance is due 60 days before the tour departs. Tours can be booked up to 10 days in advance, full amount would be do at booking.